Back in the days before CGI, my roommate was a special effects makeup artist. At that time I had a few friends in this field. There was an ongoing argument that I would have with my creature-making friends about Yoda and E.T., back when both of these characters were make of rubber. They were really just suffocated puppets. My roommate’s view was that both E.T. and Yoda were poorly sculpted. It bothered him that Yoda looked like puppet. Now, he may have been correct. But it doesn’t matter. 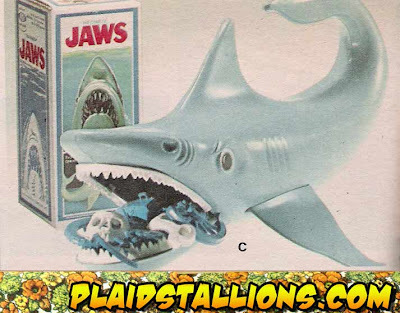 Jaws was released in 1975 and the shark looked like a big rubber piece of crap. This did not prevent the film from becoming the first summer blockbuster, one of the highest-grossing films of all time, and a bona fide classic. How did this happen? Spielberg and editor Dede Allen kept the shark off-camera as much as possible (partly because the thing didn’t work). This allowed the audience to use their imaginations. Not a bad strategy. They also told a good story and created characters that we cared about. This is a novel idea in today’s Hollywood, but it used to be standard practice. Creating compelling characters and putting them in a story for an audience to be invested in produces the illusion of life better than any computer imagery ever could. Yes, the audience could see that Yoda was a puppet, but they were so interested in this unusual character that they allowed themselves to be “fooled” into believing he was a living, breathing being. E.T. was another example of a puppet (albeit a sophisticated puppet) that people believed was a creature with feelings, dreams and motivations. When I saw the film in 1982 I don’t remember a single person in the audience saying that the puppet was poorly sculpted. People cried when E.T. “died” and cheered when he was revived. With all due respect to Carlo Rambaldi who built E.T., the first step in making E.T. live was writing the script. Melissa Mathison made the alien come alive on the page. She constructed a story that made us sympathize with a fictional alien when he was left behind on a planet not his own. Her words made us both happy and sad when E.T. went back home. Today we could arguably make a “better looking” E.T., but would he would not be any more believable. In recent years we have spent a lot of effort trying to make creatures look more real. Maybe they do. But they don’t feel more real. No one cries when they die. Our job as storytellers is to make characters as real as possible, so that people can suspend disbelief. Our job is to make it so bits of rubber or bits of digital information can live in the minds of the audience. When I was a kid there were few television stars as big as Ms. Piggy and Kermit the Frog. By no standards do these characters look realistic. They do, however, live as far as the audience is concerned. For thousands of years people have imbued puppets with emotion and feeling. The puppets can be crude or sophisticated, it makes little difference. If the story is relevant and well-told, people will believe even a sock puppet can talk. My hope is that Hollywood will once again concentrate on story and storytelling, instead of empty spectacle, because this is not what pulls us into the film experience. No, it is character and story that does that. If they get that right we will fear a rubber shark, cry for a dead alien, even worry about a digital fish lost in the big ocean. No matter how much better technology gets, it will not improve on good story-craft. Make your characters live on the page and they will live on the screen.